My son, now 17, was diagnosed with Asperger’s at age 12, though we knew there was something “different” about him long before then. I remember going to school for career day and seeing several kids in the hall excitedly greet my son, who just walked right by them without even acknowledging they had spoken to him. As he grew, I continued to have to prompt him to return greetings, order for him in restaurants, and plead with Boy Scout leaders to understand and forgive his lack of eye contact and limited communication in his boards of review to make rank. I put him in a small private school to prevent him from being lost in the crowd at a large public middle school. After learning about homeschooling from a colleague, I spoke to my son and asked him if he’d be interested in homeschooling when I retired from the military. It took him less than a second to give me a resounding “Yes!” For the next year, he constantly bothered me about when we would start homeschooling. After retiring, we took the plunge at the beginning of his 8th grade year. While we immediately enjoyed the freedom homeschooling provided to “do our own thing” with his curriculum and schedule, we did not anticipate the life changing effects we began to see over time. In less than two years’ time, my son went from barely being able to return a greeting and having few friends to having a thriving social life and competing actively in public speaking competitions! He became recognized as a leader by his fellow Boy Scouts, who elected him as one of the key leaders of the troop. As I write this from the back of the room at a speech and debate practice, my son is flawlessly delivering from memory, with confidence, eye contact, natural movement, and feeling, a 10-minute speech he wrote on a historical figure, to a room full of people. While this breakthrough started several months ago and this is not the first time I’m seeing this, I still watch with my jaw in my lap and tears in my eyes every single time. Who is this child? How did this happen? 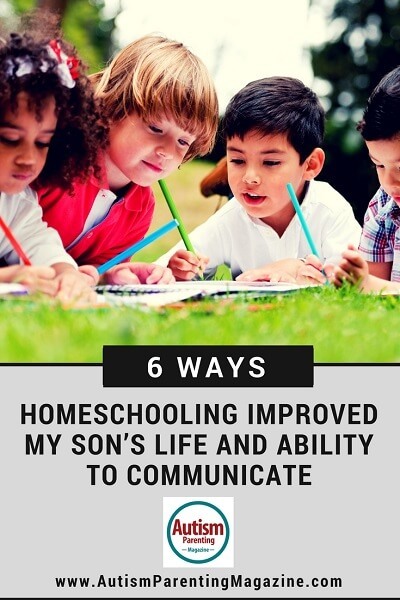 Thinking back, I was able to trace the path of this miraculous change and categorize the six ways homeschooling improved my son’s ability to communicate and transformed his life. 1. The myth of weird unsocialized homeschoolers is just that – a myth. According to Bryan Ray, PhD, from the National Home Education Research Institute, there are 2.2 million homeschooled children in the US today, and the rate continues to grow at a steady pace. There are thousands of homeschool families in our area and ample social opportunities – too many to choose from — with homeschool peers. This provides more opportunity to select friends based on shared interests and not just proximity in a classroom. With choices of multiple academic and social homeschool cooperatives (co-ops), sports leagues, academic leagues, etc., and homeschool days at skating rinks, trampoline parks, zoos, aquariums, and more, my son has been able to seek out like-minded friends from across the area, as opposed to simply trying to befriend the kid who sits next to him in class at school. The result has been a greatly enhanced social life and a great circle of friends. 2. Public school, while providing some choice in electives, does limit kids to a fairly standard set of class choices, especially in the core subjects. Homeschooling allows the freedom to pursue subjects my son is extremely passionate about and therefore eager to share with others. We all know the stereotype of Asperger’s obsessions. One only need to look at Sheldon Cooper and his trains on the hit TV show “The Big Bang Theory” to see this stereotype brought to life with a humorous twist. My son’s passion involves current events and foreign affairs. He’s a budding Middle East expert, and homeschooling has given him the freedom to develop this expertise through self-study that is not a distraction, but central to his personalized curriculum. It has also served as a gateway to getting him up in front of others to speak. At the beginning of his Sophomore year, for his language arts credit, I signed my son up for a homeschool speech and debate league to overcome his fear of speaking. Needless to say, he was not happy with me. One thing initially got him out the door to club meetings – the debate topic was on Middle East policy! Furthermore, he chose to write his informative speech on cultural understanding in the region. He began the year clutching his paper and refusing to open his mouth, and ended the year comfortably speaking, though he never got “off script” with his speech that year (that came the following year, as well as the addition of limited preparation speaking on current events!). His ability to speak off the cuff blossomed in debate due to his vast knowledge of the subject, and by the end of the year, he was simply not the same child. I gave him additional opportunities for public speaking by setting up a Model United Nations class at our homeschool cooperative and taking him and his friends to regional competitions, where my son voluntarily took the floor to speak to packed rooms, representing his assigned country. This targeted public speaking work led directly to blowing away his inhibitions in everyday life when it came to having conversations with people, ordering in restaurants, and basically being far more self-sufficient in his communication skills. 3. Homeschooling allowed me to push him outside his comfort zone, but in a comfortable crowd. I try to imagine what would have happened to my son at a public school with a good speech and debate program. Tripping all over himself in cross examination in debate, using his script all year for his speech – clearly he was not a “winning” member of his team. Would he have been cut? Pressured out of the program? Ridiculed by his peers? None of this happened in our homeschool league, despite the fact that it is a premier nation-wide organization filled with some incredible talent. My son was nurtured by the parents and encouraged by his fellow students every step of the way. He would never have reached this point, where his coaches think by next season he will be advancing to Regionals, if he did not have the incredible support of the homeschool community. I can’t say that bullying does not exist in the homeschool community, but instances are few and far between, and we have not personally experienced any. Homeschool kids, by and large, accept each other for who they are, embracing every quirk as an integral part of your character. 4. When I was preparing to homeschool, I read one book cover-to-cover – The Well-Trained Mind by Susan Wise-Bauer and Jessie Wise. I remember reading, in a chapter on socialization, that homeschooling offers a more natural social construct through daily interaction with people of all ages, as opposed to the artificial social construct of the same-age peer group in a classroom, something they will never encounter in life after school. You will interact with people of all ages in your workplace as an adult, and in life in general. By taking classes with a range of peers and being surrounded by younger kids at homeschool co-op, and being put in more situations where he had to communicate with an adult (and couldn’t hide in a room of 30+ kids), my son now converses easily with children (he’s a chess coach now!) and adults. We now eagerly anticipate college entrance interviews and job interviews instead of dreading them. 5. Every homeschool co-op teacher or activity leader is also a homeschool parent who appreciates every child as an individual and is naturally accommodating. When he was in public school, my son’s 504 Plan wasn’t worth the paper it was written on. We had various experiences in public and private school where his needs were just not being accommodated, as well as a few experiences with frustrated teachers that bordered on traumatizing for his self-esteem. 6. Homeschooling has boosted my son’s overall confidence and self-image by not fighting against cookie cutter expectations at school. And my son is not alone. He has a younger sister with severe ADHD who tried desperately to “succeed” in public school. Years of being beaten down by a system that doesn’t embrace who she is and demands that she cram a square peg into a round hole has taken a toll, and after going back-and-forth from public to homeschool for the past few years at her request, she has joined us at home permanently to begin her journey to healing her spirit and finding her future path. Homeschooling gives these unique, special kids the freedom to be themselves, and nothing is more liberating. Christina Schweiss is a retired US Army officer and parent to two amazing teenagers, one on the autism spectrum and one with ADHD. Since retirement, she has become a full-time homeschool mom, part-time online university professor, and part-time Red Cross Water Safety Instructor. She spends most of her free time organizing and running chess programs for community youth.